Even more flexibility with mobile time recording. How does mobile time recording work? Recorded data is transferred to one of our working time servers via a landline or mobile telephone network. This data can then be retrieved by using convenient software on any PC connected to the internet. All data recorded via telephone is recorded in log books for traceability. Why mobile time recording with AB-WorkingTime? AB-WorkingTime's complete concept supports mobile time recording from the very start: You have a high degree of flexibility in recording and altering all master data and in retrieving working times because you can access your data from any PC connected to the internet. Minimal costs with innovative technology and flat rate billing. Mobile time recording is not costly to implement as you do not need expensive PDAs with specific software. You can record working times via any telephone that makes outgoing calls. Recording is especially convenient via telephones with an address book or speed dialling - in fact, almost any commercial device. 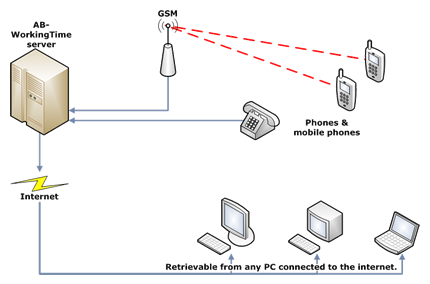 So, you can use low-cost pre-paid telephones or any private or company mobile phones that your personnel already use. This means your staff do not generate any additional expenses and do not have to carry an additional device around.